Sea World Theme Park has been added to your itinerary. 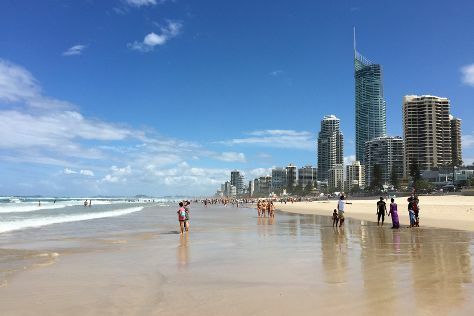 Relax by the water at Surfers Paradise Beach and Mooloolaba Beach. Deepen your sense of the past at sights like Sunshine Castle and Old St Stephen's Catholic Church (Pugin Chapel). Get out of town with these interesting Brisbane side-trips: Pelican Feeding (in Labrador) and St Vincent's Catholic Church (in Surfers Paradise). There's lots more to do: let the kids burn off some steam at South Bank Parklands, contemplate in the serene atmosphere at Nepalese Pagoda, take in the architecture and atmosphere at Albert Street Uniting Church, and tour the pleasant surroundings at Burleigh Heads Beach. Sydney to Brisbane is an approximately 4-hour flight. You can also do a combination of flight and bus; or drive. April in Brisbane sees daily highs of 30°C and lows of 19°C at night. Wrap up your sightseeing on the 24th (Wed) to allow time to travel back home.